A beautiful glass square photo tray personalised with 'mummy &' and your choice of name. This vintage-style photo tray is made from glass within a brass framework. A stylish way of showcasing your special memories, it is the perfect size for 10 x 10cm photographs. 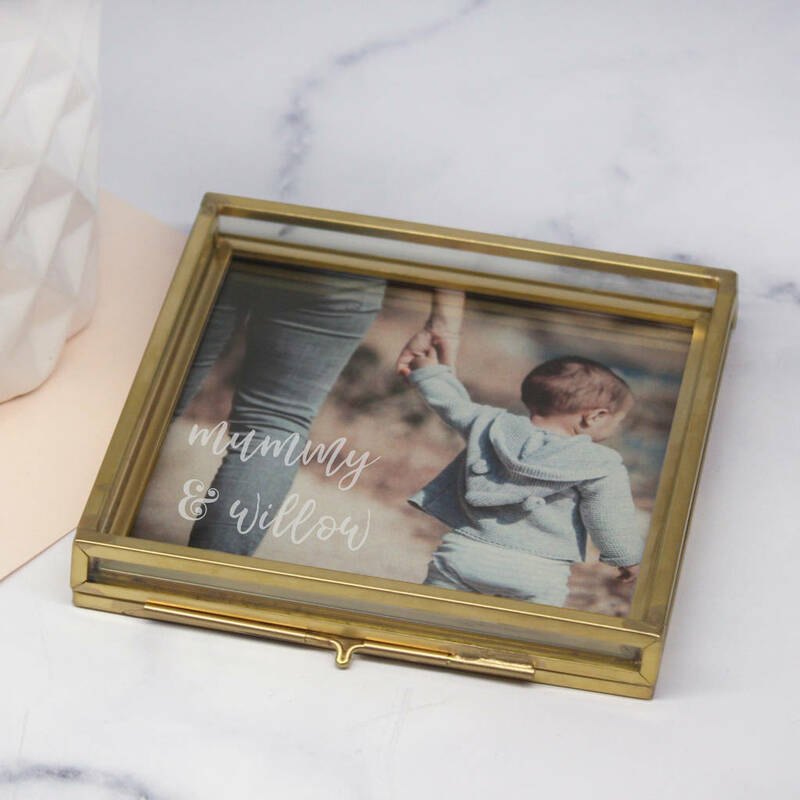 This practical glass tray would make the ideal gift for Mother's Day and the base of the tray opens for you to place your own photo in. This way you can easily update the tray by changing the photo as often as you would like. It is a great solution to stylish accessory storage - a great place to keep jewellery and keepsakes. You can personalise your tray with a name and this will be laser etched onto the surface of the tray. Please note that the personalisation including the name, will be etched in lowercase letters. Photographs are not included. The bottom of the tray opens on a hinge where you can insert your photo. The tray measures 10.7 x 10.7 cm, and has a height of 1.6 cm. This tray fits a 10 x 10cm photograph. This product is dispatched to you by Maria Allen Boutique.